Mama has to go back to Georgia for the week – her childhood best friend’s mama died so she’s going to the funeral. That leaves us in the evil clutches of Daddy (aka “Catman”) for the week. 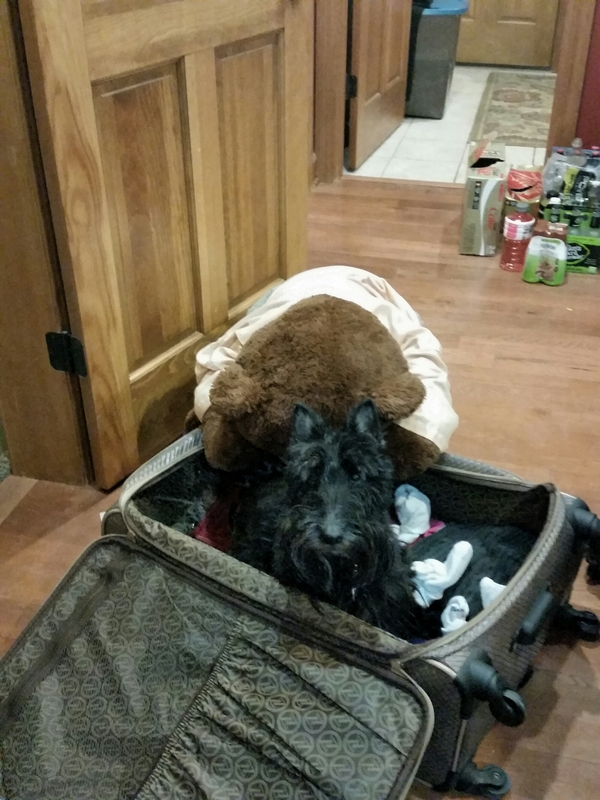 I’m reverting to my tried and true #occupysuitcase to prevent her leaving – Mr Bear is trying a new technique – holding onto the suitcase wailing and crying. I’ll let you know if either works. Oh Sgt…..there is just some things you cannot stop, and the needs of a friend are calling….betcha Catman will take good care of everything! Good luck. I try Occupy Suitcase, it usually just means I gets to go to. Time for a visit to the Aunt Judy & Uncle Bob Inn….or can you even get there because of the snow? Mama might encounter some evil weather in Georgia……get her to pack some warm clothes. What about calling on Ainsley for her assistance. Maybe girl to girl talk would help. She should also be sitting in the suitcase next to you. Angus, you know you and sister are always welcome at the Aunt Judy Inn. I can go to the store for the fresh green beans that you two love. I also have more cod and turtle . Love Aunt Judy and Uncle Bob. So sorry to hear about your mama’s friend’s mom. Mr. K has tried OccupySuitcase as well. It is very difficult to say no to that! Let us know if your tactic worked. Much love, The Scottie Mom.